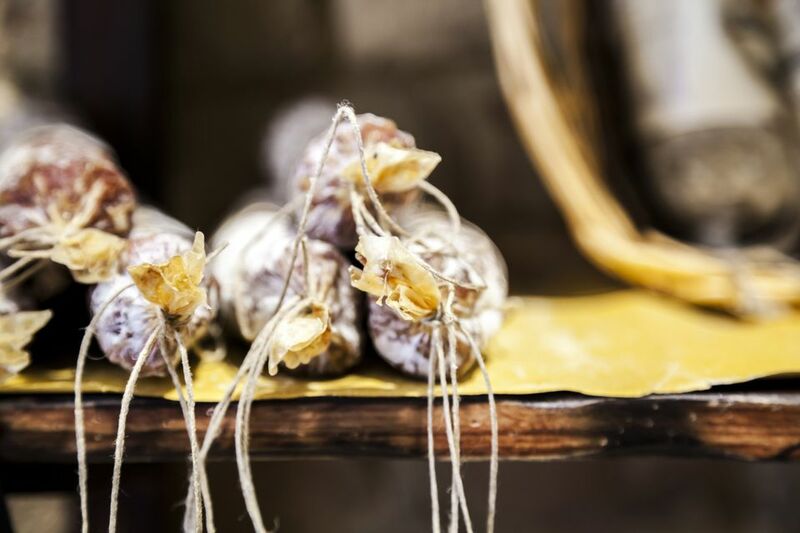 Finocchiona, a Tuscan salami flavored with fennel seeds, allegedly owes its origins to a thief at a fair near the town of Prato, who stole a fresh salami and hid it in a stand of wild fennel. When he returned for it, he found it had absorbed the aromas of its hiding place and had become quite delicious. Whether or not the story is apocryphal (it likely is), Finocchiona is indeed a wonderful treat. There are two kinds of Finocchiona, the first being Sbriciolona, which is a very fresh, soft, and crumbly style that can be spread over bread with a butter knife. The other is a cured, aged Finocchiona, which is much firmer. Chop the meat quite finely, first the lean meat and then the fat, and combine them in a bowl. Pound the garlic clove to a fine paste with a mortar and pestle and combine it with the salt, pepper, fennel, and wine. Mix the seasonings into the meat and work the mixture thoroughly, until it begins to gain a certain degree of cohesion. Take your casing and fill it, tamping the meat down to keep air pockets from forming. Press the filling down from the inside and squeeze down from the outside so as to obtain enough free casing at the top to be able to tie it tightly shut with strong string. To keep air from becoming trapped in the middle layers, puncture the casing uniformly with a fine-pointed tool known as a Pettinella (little comb), and continue to press the meat to compact it as much as possible. At this point, the casing has to be tightly tied. Using the same string used to close off the end; tie both up, down, and around the salami. To cure it, place the Finocchino in a cool (65 F/18 C) draft-free place. It's vital that it not draw heat during the process. Ideally, lay it in hardwood ashes of an isolated part of the cellar, far from hot-water pipes. It will be ready in about 4 months.